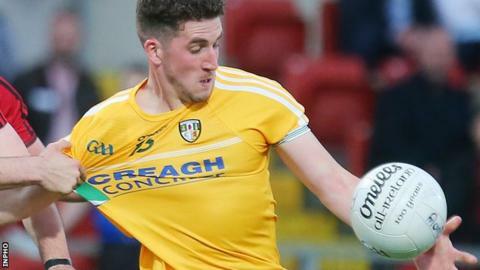 Antrim came back from five points down at half-time to end their Division Four campaign on a high with a four-point win away to Limerick. Ryan Murray and Matthew Fitzpatrick led the second-half revival with the two goals in the Saffrons' 2-12 to 1-11 victory at Newcastlewest. Murray struck seven minutes into the second half, with Fitzpatrick scoring 10 minutes later. It was a third win in seven league outings for Lenny Harbinson's men. A Cillian Fahy goal had and six points from Jamie Lee saw Limerick, who ended their league campaign with two wins and five defeats, lead at 1-7 to 0-5 at the interval. The Division Four final will be contested next week by Derry and Leitrim.